I think there is a difference between macro level safety which has never been higher and micro level incidents that are impacted by the treehugger article linked. While there may be a change in the potential mix of incidents via mass disparity eg. SUV vs Compact, the overall rate of fatalities continues to fall. Collectively, drivers have never been safer. There may be some winners and losers according to vehicle choices but on the whole you are much less likely to die driving a car. According to that chart, drivers were safer up until around 1921. I wonder how that extra weight factors into the increase of fatalities of pedestrians and cyclists. That alone will be well worth the autonomous cars. The proper academic thing to do would be to wonder if first, rather than how. Link (PDF). Pedestrian crash deaths constituted 11 percent of total crash fatalities in 2006, down from 13 percent in 1997. Pedestrian crash fatalities are decreasing slowly. The pedestrian fatality rate per vehicle mile traveled has declined as a longer term trend. The majority of killed pedestrians were male, elderly, White, Non-Hispanic, and had no alcohol involvement, yet they carried out one or more unsafe actions during the crash. The majority of drivers in fatal pedestrian crashes were male, between the ages of 21 and 25, were not drinking, and were not speeding. This report also confirmed an earlier published report that almost all drivers survived the fatal pedestrian crashes, and most drivers committed at least one erroneous action. Nearly 46 percent of pedestrian fatalities are alcohol-involved. Pretty clear that weight of the vehicle is very low on the blame list. Pedestrian deaths are on a downward trend. 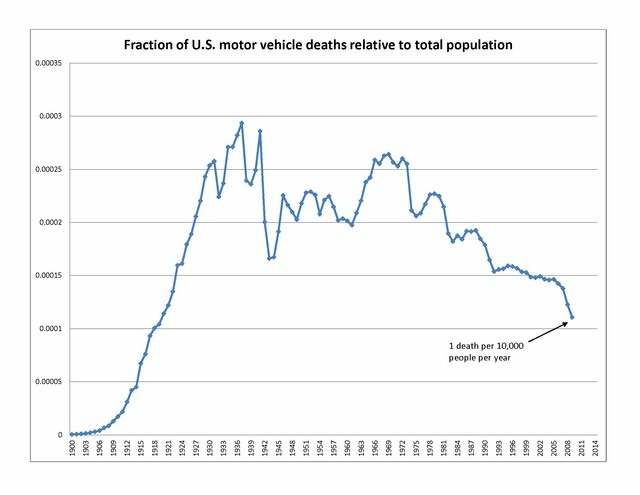 Vehicle deaths are on a long downward trend. According to this PDF, number of vehicle accidents in total are down since 1990. That TreeHugger piece doesn't help the automated car argument at all. Let's be honest, it's just some guy who wants cars to be lighter so that we use less gas, probably. Btw, American consumption of oil is on a downward trend too :). This week's freakonomics podcast is all about this very topic we seem to have covered all their points already. I wonder if there's a correlation in the number of pedestrians and the number of pedestrian deaths. Oh, and their most recent reports show an increase in pedestrian deaths in 2010, 2011, and 2012. Of course they do. You didn't expect Cheeba to post evidence that would prevent him from playing the smug victim card, did you? In this thread you've posted twice. Neither post has anything to do with cars or technology. Both posts are simply to insult me. That's all you've added to the thread: insults. At what point do you look in the mirror and finally come to the realization? I've never insulted you. I've never gone into a thread where you're posting and added nothing but personal insults directed at you. Perhaps it is time for you to do some self-reflection and come to understand why you cannot do the same (hint: it has nothing to do with me). EDIT: I'm changing this so it's less... combative, because that helps no one. Let's just say I have a problem with how you talk to people and leave it with that, and the evidence for this is all over the forums. In the interest of fairness, if the advent of self driving cars helps to cut down on fatalities from drunk driving and otherwise preventable vehicle deaths, I'm all for it. It's likely be easier to process for some people, though, if you made it a function you could turn on and off. Some of us get a system we can use when we want to, and folks who don't want it can turn it off. That would probably be enabled by default since it would be incredibly inconvenient to not be able to use your vehicle if the driving hardware were to break for some reason. At the very least, having manual override as a safety feature seems like a no brained to me. I suspect that even that will go away eventually and be replaced with a "pull over and call home" feature. Sorry Ziffer, but I couldn't find any references in that NHTSA study to the mass or weight of vehicles. Pedestrian deaths also seem to be falling, but not as fast as vehicular deaths. If I were have a guess I would think this is that survivability of a crash is one of the areas of improvement in a car, whereas a pedestrian remains fragile. Even the lightest car is going to deal significant damage to a person once it has a certain velocity. I don't think, so. At the very least, being able to manually drive the car would be very convenient for repair and maintenance when the automatic driver goes offline for maintenance or because it's been damaged. Having to use a tow truck for that every single time would probably be grossly inefficient and annoying as all heck. I'd expect the driver's seat to eventually be converted into another comfy passenger seat with an option to turn it around to facilitate "maintenance mode." In this future time, the driving experience would probably be an afterthought, so it won't be good, but it will probably still be there. It is the time of year for releasing stats. In my home state this is the lowest road toll since 1924!! Single vehicle incidents on rural roads are the largest identified component of our toll. A self driving car seems to me to be less likely to be involved in these kind of incidents which are essentially driver errors. Somehow 18-25 year olds managed to stay alive better than any point in history. This is an anomaly I expect to disappear next year and so when this number regresses to the mean it will be a Road Safety Crisis (tm) and "something must be done". I'd say I'm surprised, but I'm not. I just can't wait. To be able to read a book or play on the iPad during my 40 minute commute. I loved being able to do that when I lived in Boston and took the train but Iowa doesn't have that infrastructure. It will be great when we can have these on the normal roads. I was hoping for some interesting insights but is just was an article talking about how much safer and more efficient public transit is. Well duh! However we have pretty much said "no" to public transit in anywhere but the densest population areas in the US. The beauty of self driving cars is they are not public transit. People can keep their individualism, they can go where they want, when they want. People seem to want that. 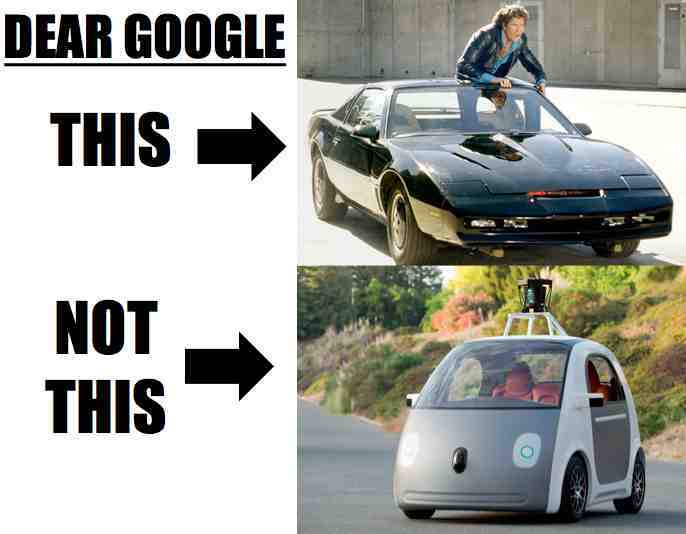 Anyway I thought it was worth posting an opposing view to my optimism about self driving cars. Self-driving cars can't get here soon enough, IMO. Not only that, but it will be significantly more efficient than trying to reach the lower density population areas. Public transit will not happen for those areas in it's current form. It's a simple matter of scale versus return. I really hope we get cars released soon with at least the allowance to drive on interstates or other separated highways. I would think that getting this intermediate step would be the easiest way to get legislation passed allowing driverless cars. We already have cars with cruise control adjustment and warnings when crossing lane lines. These are the main issues on a interstate aside from a random wild animal jumping out in front of you. It's a really small step to the public compared with total conversion. It's pretty clearly a prototype vehicle, intentionally using the low-speed vehicle rules to avoid California's requirement for a steering wheel in autonomous vehicles. This isn't the final form, just a test platform and ambassador. I don't want my self-driving car to sass me in a stuffy Mid-Atlantic accent. I wonder how insurance requirements for self driving cars will shake out as the technology gets dialed in. I want want one of these so badly. I really hate driving. The Mathematics of Murder: Should a Robot Sacrifice Your Life to Save Two? It happens quickly—more quickly than you, being human, can fully process. This, roughly speaking, is the problem presented by Patrick Lin, an associate philosophy professor and director of the Ethics + Emerging Sciences Group at California Polytechnic State University. In a recent opinion piece for Wired, Lin explored one of the most disturbing questions in robot ethics: If a crash is unavoidable, should an autonomous car choose who it slams into? It might seem like a simple thought experiment, a twist on the classic “trolley problem,” an ethical conundrum that asks whether you’d save five people on a runaway trolley, at the price of killing one person on the tracks. But the more detailed the crash scenarios get, the harder they are to navigate. Assume that the robot has what can only be described as superhuman senses and reaction speed, thanks to its machine reflexes and suite of advanced sensors. In that moment of truth before the collision, should the vehicle target a small car, rather than a big one, to err towards protecting its master? Or should it do the reverse, aiming for the SUV, even if it means reducing the robo-car owner’s chances of survival? And what if it’s a choice between driving into a school bus, or plowing into a tree? Does the robot choose a massacre, or a betrayal? Google's surprise reveal of its first in-house self-driving car prototype shook the the auto industry like a California earthquake this week, and quickly became the biggest car news of the year. To an industry that still expects journalists to come to its car shows, Google's announcing its "first car" at the a conference put on by Silicon Valley journalists Kara Swisher and Walt Mossberg was almost as shocking the fact that the vehicle has no steering wheel or pedals. Though the Silicon Valley-facing launch was a blow to the industry's pride, Google's decision to abandon traditional vehicle controls is what will keep auto executives up at night. Whether Detroit wants to accept it or not, driverless cars will be the key step forward in the trend away from ownership of cars and toward access to mobility. They herald the end of an industry model built on scale. Like Amazon's Kindle before it, Google's automobile trades away the upfront sale profit of a traditional car (or book) for a stream of revenue: content, advertisements and car-as-service fees. This development was not unforeseeable to the auto industry. But the overwhelming fixed costs of the traditional business model has always hindered automakers from really changing things. The companies are also largely made up of people who genuinely love cars and driving, making them highly adverse to autonomous technology. By fostering the automotive enthusiast culture, to the tune of trillions of dollars over the last century, automakers have created performance-related profit centers that pad their bottom lines. Good luck convincing Google's robot driver to upgrade to the turbocharger or sport suspension. Yet perhaps the auto industry's biggest problem right now is that the public (and usually slavish press) are already going crazy for the Google car in ways that the carmakers simply hasn't been able to inspire in ... well, a long, long time. Like Tesla and Uber before it, Google is scoring a major publicity coup by pointing out a simple truth: the car industry is, on a certain level, terrified of innovation. From the Silicon Valley perspective, industries that don't hold regular revolutions are asking to be messed with, and though cars have improved enormously over the last century, they are are clearly in a conceptual rut. The enthusiasm for a car that seems to flaunt every industry design norm -- combining equal parts cartoon character, toaster and golf cart -- is yet another sign that everything the automakers know is wrong. On the other hand, Google has apparently studied what it would take to manufacture its own cars and came to the conclusion that it would rather not. So for all the Silicon Valley triumphalism, Google's first 100 prototypes were built by an manufacturer in the Detroit area -- reportedly Roush Enterprises -- and Google's car project leader tells Re/code, "we’re looking for friends and partners to make [manufacturing] happen.” In other words, Google isn't really going into the car business ... it's trying to push the automakers into partnering in a major change they don't want to see happen. Most of the car industry is not going to rush to commit to Google's post-steering-wheel vision, and will seek to add various autonomous-control features to the traditional car cockpit for as long as possible. 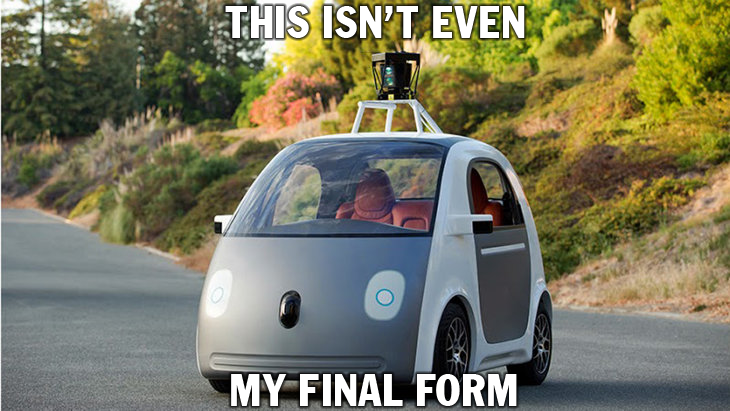 Google still hasn't begun public testing of human-control-free cars, and will have to get permission state by state. Its vehicles are also limited to Federal Low Speed Vehicle standards, meaning they stay under 25 mph, as regulations require steering wheels and pedals on highway-capable cars. As Megan McArdle points out, this low-speed approach has its advantages in terms of the liability issue, but it also points towards a bigger challenge: navigating regulations based on traditional automobiles, made in cooperation with an industry that is inimical to Google's vision. As with Tesla's dealer-free retail model and Uber's frictionless taxi service before it, Google's automotive challenge will be as much about politics as technology. But if Google can get regulators on board with steering-wheel-free cars, the auto industry may not have a choice in the matter. Because for all the excitement about Google's autonomous car technology and how it might affect the Ubers of the world, there seems to be little interest in who is going to make the things. To some extent, this is Silicon Valley myopia, blind to the reality that a few automakers such as Nissan have committed to fielding autonomous cars (just as Tesla has stolen the electric car thunder from the vastly more impactful Nissan Leaf, thanks to the Valley's self-obsession). On the other hand, the resounding public apathy towards the traditional auto industry suggests that Google could simply outsource production to a major automotive supplier such as Continental or Magna and leave the heel-dragging major manufacturers behind. This would be the ultimate blow to the car business, pushing it towards a post-industrial footing in which the question of who actually built it is no more important to a car brand than it currently is to Apple's iPads. And it's yet another nightmare vision for the car industry that remains trapped in a V-8 powered past. I've seen that article before, and I find it pretty unconvincing. It's a fundamental misunderstanding of how artificial intelligence operates, though it's a common enough misunderstanding that Asimov's Three Laws of Robotics duplicates the error (though Asimov, at least, was well aware of the distinction). We, as humans, can separate things and people into differentiated Aristotelian objects and easily reason about them in abstract ways. While computers manipulate symbols in superficially similar ways, they are unlikely to have the same categories unless we impose them on the machine. If we want the robots to make a distinction between one person in a car and two people in a car we're going to have to put a lot of work into making that distinction. Contra the article, this isn't an inevitable side effect of robot cars, it's something that would have to be deliberately designed. We, as a society, may force that design, but even in that case braking to an early stop is such an overwhelmingly effective failsafe (especially in a car that prioritizes safety over speed) that a car that can't do that is likely already completely out of the machine's control. We, as a society, do need to learn to understand indirect consequences of the systems we use. Most people, even today, are ill-equipped to reason about the indirect interactions of abstract systems and their ethical implications. But your properly designed car is unlikely to ever choose to kill you.